There's a nice bottle of wine, and then there are the tools, tastes, and terroirs most precious to the professional sommelier. Here's a holiday wish list culled from the professionals—spanning the gamut from functional to fanciful—to guide you through buying for the cellar rat and/or professional wine geek in your life. In many cases, prices vary depending on vendor. Why: This is most the amazing champagne sword in the world. I can be a sommelier and feel like Conan the destroyer. Why: I ride my bike 10 miles each way to work and this seems like a perfect way to transport my favorite beverage. Why: If Santa thought I was a really, really, good girl this year...he would get me this. If a corkscrew could be described as a stone. cold. fox. It would be this. Why: I'm really digging these t-shirts from Epicurean Apparel for the holiday shopping season. In the restaurant business, we work very hard, and we party hard, too. At work we're serious, but when we get the rare day off, we're light-hearted and playful, like these T-shirts. They're a great gift for the food and wine lover in your life to wear when they, occasionally, get to dress casually! 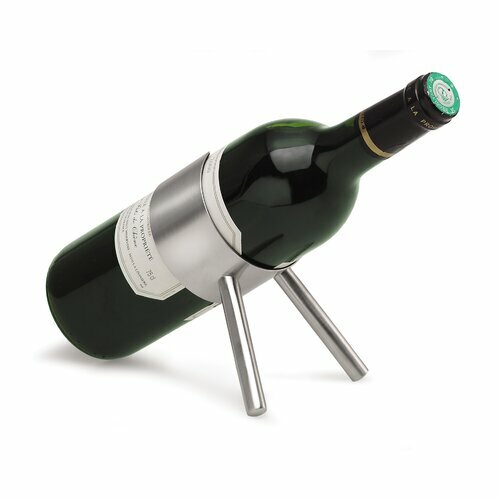 Why: I am hoping to find (receive) a really cool wine cradle. You know, one of those snobby things you lay a bottle down in to be pretentious? When you decide to open up an aged bottle of wine and you didn't think far enough ahead to stand it up and let it rest 48 hours, one of those cradles is exactly the ticket. Too many old wine experiences are dramatically lessened by bad decanting or handling of the bottle ... my 7 cents. Why: I'm asking Santa for black tasting glasses from Riedel. One of the most profound blind tasting exercises I've ever had was when Larry O'Brien, MS, blind tasted me using black glasses. It's amazing how much we depend on sight to help us determine the wine! It really makes you focus on the aromas, flavors and structure of the wine. Why: The coolest wine key on earth!!! Why: Simply the most beautiful cocktail mixing glass. Why: This is an old-style ambient yeast fermented Sake, the natural wine of the sake world! Why: I have been obsessed with rum for the past year. As of this weekend, I got close to reaching the bottom of my only bottle of Havana Club, so if anyone would care to replenish my “Rum Wall” and smuggle me a bottle along with a Cuban cigar or two I would be forever gracious. But from a legal standpoint I could settle with a vintage 1980s Rolex Oyster. Why: The Zalto family's history of hand-blown crystal dates back six generations, and each piece of their crystal is a piece of art: beautifully balanced and incredible to drink from. Why: This movie doesn't have the commercial appeal of a “Sideways” or “Bottle Shock,” but it’s 100 percent right for a wine nerd. I don't think I've ever heard of any film documenting a wine consultant behind the scenes or Parker's direct impact in Europe. Even if you agree or disagree with the direction of the movie, it’s extremely thought provoking. Why: Santa was very nice to me last year and brought me an engraved (monogrammed actually, cause that's how we do in the South), Code38 Stealth wine key. I would like to add the newly available holster to my wish list. Why: Can never have enough books. Why: Just because sometimes it's fun to get fancy. Why: Until I can afford a six-burner range with hood, I will always need more stove top-space. Why: These are great stocking stuffers and people are always trying to swipe mine. A bottle each of the 1977 Fonseca, Gould Campbell, Graham's, Taylor Fladgate, Dow & Croft Vintage Port (various sources, between $130-$260 per 750ml bottle) and a bottle of the 1977 D'Oliveira Terrantez Madeira (Rare Wine Company, $125.00). My birth year wasn't much of a wine vintage, save for vintage port (and Madeira). I'd like a little collection that I can hang onto for some time and share. …And while Santa is shopping at the Rare Wine Company, a bottle of the 1780 Borges Bual Madeira (RWC, $2,450.00) because that might be the oldest wine I'd ever have. And because I've been a very good girl this year. A replacement Laguiole Champage Saber - Hugh Davies from Schramsberg sent me a beautiful one and I left it to my team at Cook Hall in Atlanta to pop corks off their patio and onto Peachtree Street. Why: My favorite wine cradles from Blomus - Easy, low profile and chic. A great wine geek accessory. I left mine at Market in Boston. Why: A replacement seltzer bottle - I love the one that I bought at Williams-Sonoma - so much fun for finishing drinks (gives my bar a vintage feel) and also way more fun than lugging cases of bottles of sparkling water up the stairs to my apartment. I left mine at JG Steakhouse in Washington, DC, so that they could make Cherry Yuzu Rickeys at the bar. Chef Damon Gordon and Sommelie.. Chef David Bull and Sommelier .. Chef Jeremy Bearman and Sommel..
2011 2nd Annual StarChefs.com ..
2011 StarChefs.com New York Ri..